There are almost 20 million families in the UK, with 14 million dependent children living with them. Dual-income households are now the norm in the UK with the percentage of both parents working full-time increasing from 26% in 2001 to 31% in 2013. We can safely assume it’s even more now. Given these statistics, it’s more important than ever for employers to take the needs of parents into consideration when developing their policies. Unfortunately, the recent report published by charity Working Families and Bright Horizons Family Solutions, paints a very different picture. 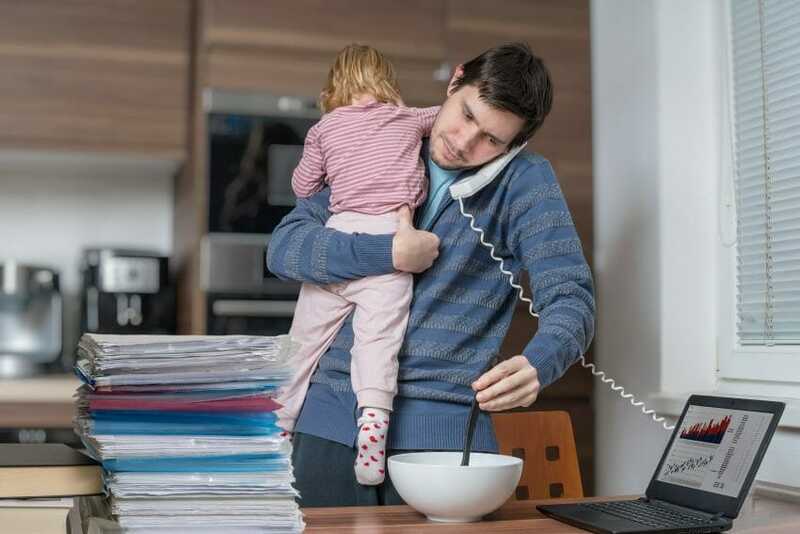 The report has revealed that full-time parents are working 40% more than their contracted hours, and part-time parents are putting in full-time hours, giving them less time to spend at home with their children. In fact, nearly two in five parents have admitted that work prevents them from coming home in time to see their children before they go to bed, and 42% admit that they have no time to do homework with their children. These aren’t the only issues that arise from parents working long hours. Nearly half of parents and carers confess that work affects their ability to spend time together as a family, it is the main cause of arguments at home, it contributes to eating less healthily and makes it harder to find time for exercise. Unsurprisingly, a third of parents said they felt burnt out, with more than half identifying work as the main cause of their burn out. So why is this happening in this day and age? Why are parents working more than they are being paid to do, at the detriment to their family life, their children’s future and their own physical and mental well-being? According to the report, there are two main factors; the workload – there’s far too much to do in the contracted hours – and secondly, it’s the company culture; managers expect the sacrifice, with the unsaid benefit being an advancement in their career. It’s not that there are no employers that recognise the need to support parents in their organisations. In fact, last year, Working Families revealed the UK’s most flexible and family-friendly companies which proves that the need has been recognised – but obviously not enough. If it was ingrained in our working culture, if it was as normal as taking meeting minutes or replying to an email, there wouldn’t be a need to create an awards ceremony applauding the few who promote it. So how can employers better support parents in the workplace? This is the backbone, the crux, of creating a family-friendly work environment, and while it may be a start, it needs to be more than just giving employees the option of 9-5 or 10-6. A truly flexible workplace realises that staff can be just as productive at home as they can be inside the office. Obviously, there are some jobs that require continuous interaction with colleagues, but those that do not can be done from home at least once or twice a week. That’s how important it is. Flexibility is letting staff that work from home participate in Skype meetings instead of expecting them to be physically present. Flexibility is introducing the relevant technology and software that staff can utilise to ensure they’re all on the same page, even if they’re not in the same office. Flexibility is creating an environment that values accomplishments over hours. If someone has x, y and z to do over a week, and finishes it all in four days… do you really need them for the entire fifth day? Why not let them go home early so they can pick up their child from school for a change? This level of flexibility requires flexible thinking, not just flexible hours. According to the report, fathers feel marginalised as it’s assumed that mothers are the primary carers and undertake the bulk of parenting. In fact, UK fathers work some of the longest hours in the whole of Europe. Organisations need to recognise that fathers are parents too, and as such, provide better options for them. This can include longer paternity leave and giving them the option to work flexibly, too. … as much as possible. This may not be able to be done all the time, but where possible, keep meetings/team-building days/events/conferences/AGMs/training etc., within working hours. Expecting your staff to stay late may be the difference between seeing their children just once that day and not seeing them at all. The same goes for part-time staff who may leave earlier to collect their children from school. If you know they leave at 2:30pm every day, don’t schedule an activity for 3pm. It may not be feasible to offer a fully-fledged crèche in your workspace like Goldman Sachs has done in the City of London, but what you can do is offer childcare at any out-of-hours events. Before you start worrying about DBS checks and hiring nannies, there are various companies that can provide it all for you. Nurseries and babysitters are expensive, and you should take this into consideration when expecting parents to attend evening or weekend activities. Providing an onsite crèche will boost attendance amongst parents and give those who may not be able to afford additional childcare the chance to attend. You can have all the right policies in place, but unless you change your organisational culture, they won’t mean a thing; your employees will be too embarrassed to leave on time when everyone else is staying behind or too ashamed to take another day of leave because their child has fallen ill. Take the lead yourself and encourage your staff to leave on time. Of course, there will always be exceptions when there are special projects and deadlines looming, but make that the exception, not the rule. >See also: 8 Ways to Accommodate People of Faith in the Workplace.